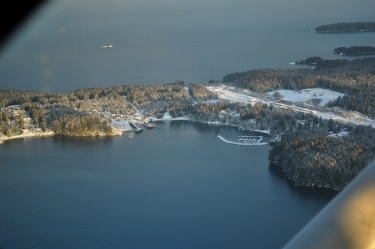 The village of Ouzinkie is located on Spruce Island, approximately 12 miles North of the city of Kodiak. The modern village of Ouzinkie, founded 150 years ago, derived its name from the Russian term "uzen kii", meaning "rather narrow". The Ouzinkie Narrows separates Spruce Island from Kodiak Island. 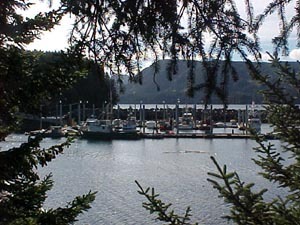 The village is part of the ancient homeland of the indigenous Alutiiq people who have continuously occupied the Kodiak Archipelago. Ouzinkie is only accessible by air and water. Currently, the population of Ouzinkie includes 200 year round residents, mostly of Russian Aleut ancestry. Forty percent of the population of the village is under the age of 25. 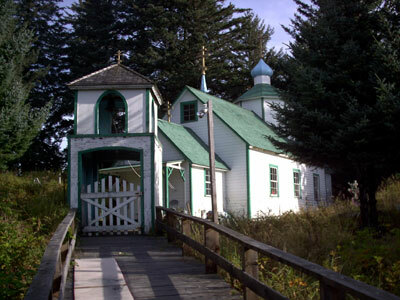 At the heart of the Community of Ouzinkie is the Nativity of Our Lord, a Russian Orthodox Church, which is a national historical landmark, built in the 1890's. The parish is still active with services held on Saturday, Sunday, and other church holidays. 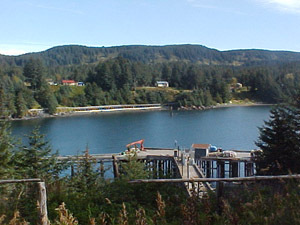 On the East end of Spruce Island is Monk's Lagoon. It is the sacred ground of the first canonized saint (Saint Herman) of the Russian Orthodox Church in North America. It should also be noted that a childrens's home sponsored by the Baptist Home Mission Society was built in 1938. Later, in 1958, it became the Christian Center Program that it is today. Located in the village are the following services: post office, grocery store, community hall, fire station, saw mill, communications uplink, local utilities, propane and diesel farms, media center/library, and health clinic. Electricity is generated locally with hydro and diesel facilites combined. Ouzinkie has an airport, boat harbor, a pier with crane for large loads of cargo, and three miles of gravel roads. There are approximately 80 separate households in Ouzinkie. 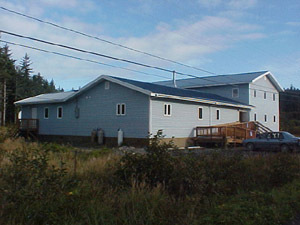 Employment is predominantly provided for through government entities including: City of Ouzinkie, Ouzinkie Tribal Council, Kodiak Island Borough School District, and the U.S. Post Office. 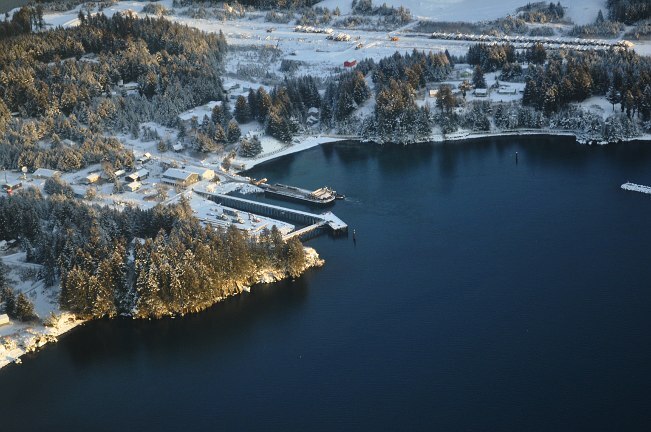 In addition there are charter boats, commercial fishing, long shoring, logging, and other private enterprises, notably the Ouzinkie Native Corporation and Kodiak Area Native Association. Unemployment in Ouzinkie is higher than the national average.